Will Your Water Filter Protect You if You Have a Boil Water Alert? Adapted from an email communication by Marianne Metzger of National Testing Laboratories. With the cold weather comes the increased possibility of water mains and pipes bursting. Pipes and mains are at risk in colder weather due to the expansion and contraction of the pipe material. Even a 10° change in temperature of air or water can cause significant stress on the pipes. Other factors like the material the pipe is made of, corrosion, soil conditions age. and ground movement also contribute to breaks. There are approximately 250,000 water main breaks every year in the United States. That’s 685 breaks per day. Water customers in the area of the break may experience a shut off of water while repairs are being made. 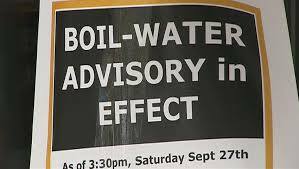 Additionally, if customers do have access to water, they may be under a boil advisory. For those with water treatment equipment this can be confusing. Many people assume that their water treatment device will take care of the problem and they can simply ignore the boil water alert. If an ultraviolet light is part of the equipment, they are right. However, homeowners with other types of treatment equipment cannot simply ignore the alert and they may even may be faced with additional maintenance. It is good practice to change out any carbon-based cartridge filter after a boil advisory because carbon can provide the optimum environmental for any bacteria that may be present as a result of the break. This applies to undersink filters and reverse osmosis units. Whole house carbon filters are also at risk of becoming growing beds for bacteria. For water softeners, it is a good rule of thumb to disinfect the system according to the manufacturer’s instructions after any boil advisory to ensure bacteria are not present. If you have doubts about the state of your water filter after a boil water advisory, a simple test for bacteria is a good idea. Bacteria tests can be arrange through most city water departments and through independent agencies that do water testing.